Are you interested in becoming a Ute? Let me introduce the University of Utah and our Men’s Lacrosse Program to you. Located in beautiful Salt Lake City, the University of Utah fosters the perfect environment for an amazing college experience. Tucked against some of the most beautiful mountains in the world, just 10 minutes from an International Airport, and 15 minutes from numerous world famous ski resorts, our campus location is nothing less than perfect. In addition, the culturally diverse city of Salt Lake and its unique four-season climate make the list of outdoor activities available to students endless, and the experience perfect for complementing the top-tier education students receive at Utah. 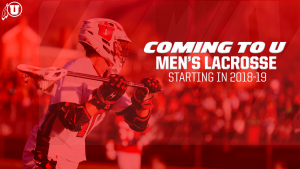 The Utah Men’s Lacrosse Program is currently a member of the Division I Rocky Mountain Lacrosse Conference (RMLC) which is consistently regarded as the top conference in the MCLA having captured 12 national championships in the last 17 years. Our program is frequently recognized as a top 25 team in the national polls, and we are annually competing for a bid to the MCLA National Championship Tournament. Beginning the 2018-19 season, we will compete in the NCAA as a Division I Men’s Lacrosse sport. Our conference will be determined. We will also compete in a brand new Men’s Lacrosse and Women’s Soccer Complex/Stadium. Attending the University of Utah is in itself an amazing accomplishment as Utah was recently ranked among the top 80 Universities in the world and have no doubt that should you choose to attend Utah, you will have as unparalleled of an experience on the lacrosse field as you will off the field. If you are interested in playing lacrosse for the University of Utah, please complete a “Prospective Student-Athlete Questionnaire” so I can get to know you and have your contact information. Additionally, I encourage you to use the links below to learn more about “the U” and even schedule a visit to discover just how great your collegiate career can be at the University of Utah. Best Regards and GO UTES!